AND . . . represents the views of Bristol’s elders. All aspects of the Babbers show are led by older people living in Bristol. We are a team of volunteers who have been trained to research, present and produce our weekly show – some of us even control the mixing desk! Babbers come from a variety of backgrounds with different interests and expertise. 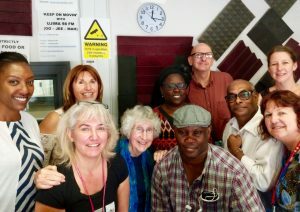 Most of us have never worked in radio before, some have disabilities, but we are all passionate about raising the profile of older people so that we are seen in a positive light. It is no coincidence that our theme tune is ‘Respect’. All content in the show is chosen and delivered by us to inform and entertain. We create shows that we would like to listen to. There is so much to gain by volunteering with Babbers – new skills, a sense of achievement, and it’s great fun! If you decide you’d like to become involved we’ll match you with a buddy who will take you through all the aspects of presenting a radio programme. We’ll provide support and training to help you with your role. How much time is involved will vary, but we do ask that you are prepared to commit to sharing responsibility for a show at least once every two months. You will also to come to planning meetings and training sessions.